It doesn’t matter if you’re referred to as a motorboat mechanic, boat mechanic, marine mechanic, or small motor mechanic: Fixing motorboats and other aquatic vehicles is what you do. If you aren’t sure what all is involved in becoming a certified marine mechanic (or boat mechanic, or small motor mechanic), then please read on to find out what’s in store for you. Work on watercrafts of all shapes and sizes. Communicate with your customers about what they think is wrong, and what you find needs to be done to get the boat up and running properly. Take care of all the routine maintenance. Test the engine for issues (hey, you get to drive a lot of boats!). Observe and test all equipment on the boat to check for malfunctioning parts. Replace or repair all the worn, damaged, or defective pieces and parts of the vehicle. Keep everything you’re doing for each client well documented. Take the mechanic certification practice test! Your customer service skills need to be equal or greater to your mechanical skills. 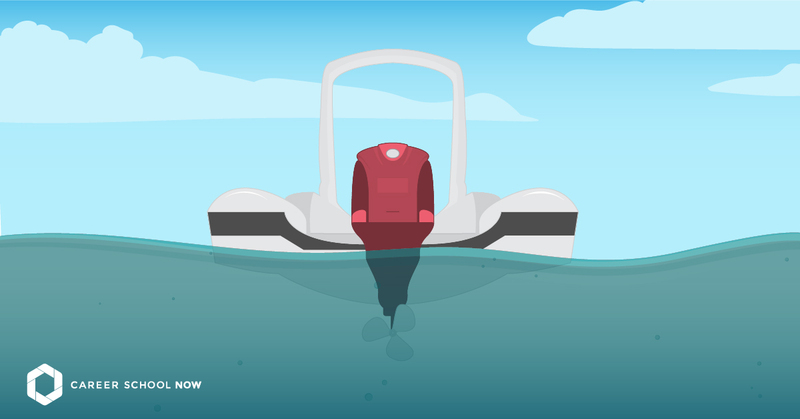 Word of mouth is going to be one of your greatest advertising efforts, so the more your clients like you, the more likely they are going to tell all their boat-owning friends about your boat fixing prowess. There are so many working parts of various sizes that you’re going to be inspecting daily, which means you need to be exceptionally detail oriented and organized. Hand-eye coordination is an important quality if you’re going to find success as a motorboat mechanic. For obvious reasons. You’re a problem solver and troubleshooter. You don’t have any issues figuring out what is going wrong inside that boat in front of you, and you know exactly what to do to fix it. You’re certified. Plus, you have memberships with professional associations (Yes, employers and customers do look for that, so it bears mentioning a couple of times throughout this guide). You should first get your high school diploma or GED. You’ll need some basic math, reading, and writing skills. Start your education through a vocational or technical school specializing in motorboat maintenance and repair. The formal schooling will give you an edge over the competition. Programs last one to two years, depending on if you go for a certificate or an associate degree. If you want to skip the school path, you’ll need to get yourself into an apprenticeship. There are some boat manufacturers and unions that offer these. Many are in conjunction with your local community college, as is true for most apprenticeships across the board. Most marine mechanics get their training through on-the-job apprenticeships. Keep in mind, even though you may be highly trained through an apprenticeship, you still may want to get some college education, especially if the person you’re training under has no intentions to keep you on as a hire. College courses = better job options. Once all your schooling and training is done, you can get a job. After you’ve had some real-life working experience, you can get certified. Good idea, because it gives you more wiggle room when asking for your salary to increase. Check out the American Boat and Yacht Council (ABYC), because they offer a certification courses specific to your marine mechanics career. Keep up that certification. Every five years you’ll need to take two continuing ed courses starting two years after your first certification. Become a master technician. This happens if you complete a minimum of three certifications through ABYC. Other careers you can train for in 6 months or less. When it comes to your chosen career, a marine mechanic has around seven different certification options available. Most of them are available through the American Boat and Yacht Council (ABYC). In most instances, you’ll need to show proof that you’ve worked in the field for two years. You can choose to get certifications in diesel engines, gas engines and marine systems, refrigeration and air conditioning, marine electrical, and corrosion, to name a few areas of specialty. CAN YOU DO ONLINE SCHOOL FOR MARINE MECHANICS? There are some online and distance learning programs available for marine mechanics. But, only for the education portion. You will need to find out about the practical learning portion, since it’s not something you can really do via the Internet. Some online programs may have you report to a participating school or facility for the hands-on parts of the lessons. If you’re looking for a motorboat mechanic program that’s done completely online, then you need to do diligent research. Also, keep in mind that the practical portion of your studies will count as experience, and if you’re not doing that, then it could make it harder to find a job once you’re done. The Coast Guard is now part of the Department of Homeland Security. You have to be a U.S. citizen, or a naturalized one. You must be between 17-27. If you’re 17, you need to have permission from your parents. You must have your high school diploma, and no more than two dependents. You have to take and pass the Armed Services Vocational Aptitude Battery (ASVAB) test, plus a medical exam—and you have to really want to spend time on boats in bodies of water. There are many benefits, both paid and otherwise, to enlisting in the Coast Guard. Those ginormous vessels moving products across oceans? Those were designed by marine engineers. It’s an important job because without those ships, our economy wouldn’t be thriving. There are only ten universities in the United States that offer marine engineering, and your goal is to be accepted to all of these. Minimally, you’ll need your bachelor’s degree. Part of your program will include a summer at sea where you’ll get experience and perspective. Once you graduate, you will need to get a license from the U.S. Coast Guard, along with one of the engineering certifications, which will allow you to call yourself professional. You’re looking at a median annual salary of more than $93K, with the top ten percent making well over the $152K mark. However, entry level is more firmly settled in the mid-$50Ks, but don’t let that discourage you—your salary goes up along with your experience. Due to the strong need for more environmentally friendly ships, the employment outlook will grow 12 percent through 2026. As a boat rigger, you’re part of a construction team that builds out hulls of recreational ships. You start out as an apprentice in a boatyard where you’ll learn the boat building basics. Once you’ve learned how to build the outside of the boat, you’ll move onto the interior. Eventually, you’ll know the inside outs of building a boat. Mostly, you’ll end up concentrating on the electric and electronic aspects of boats, from the communication devices to the onboard sound systems and beyond. You’ll earn a median salary of $45K, and work your way up to more than a $75K annual salary. Marine mechanics earn, on average, close to $39K per year. But depending on which state and industry you’re employed with, you can be earning much more than that. On the high end of the spectrum, the top ten percent of the profession is making over $61K, while entry-level marine mechanics are bringing in more than $23K. Some industries, as well as certain states, have a higher base salary than others. A slower than average job growth is expected for marine mechanics. Only around 100 jobs are predicted to be available through 2026. Engines are more sophisticated, so if you have a postsecondary degree and a high amount of training, you’ll be a good candidate for the job openings. ...Previously In High Demand: A Guide To A Certified Nursing Assistant Career Up Next... What Is A Liberal Arts Degree (And What Can You Do With It)?